Is that a Gear 360 in Santa Monica beach? Last week Peter O'Shaughnessy and myself ventured into the West Coast of the United States of America, to attend two events where we met film undergrads, PhD students, VR enthusiasts and researchers, with the intention of sharing a bit of knowledge about creating Virtual Reality experiences that would run in a browser. Here’s the recap! 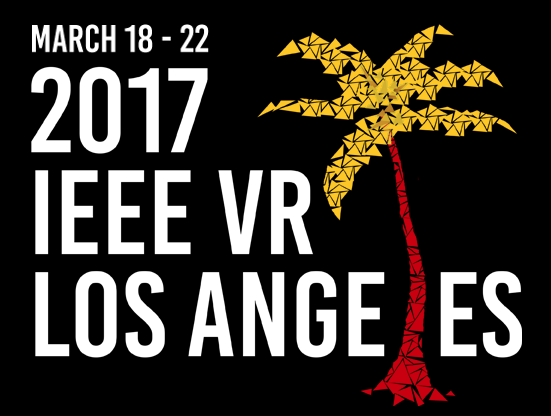 “IEEE is the world’s largest technical professional organization dedicated to advancing technology for the benefit of humanity.” As such, its research/academic conferences and symposiums are showcases of cutting edge work, making it mandatory to talk about enabling VR through the WebVR experimental API. With an early start, we presented the WebVR API and relevant associated technologies like Gamepad API and WebAudio, and what are the benefits of creating VR experiences on top of a platform that is “open, fast, secure, frictionless, accessible, widely distributed, cross device, easy-to-share, scalable, and independent of connection”. Virtual Reality on the Web slides here. Following, David Evans, PlayCanvas’ CTO, joined remotely from London to share how the PlayCanvas engine can be used to develop VR applications that run in the browser. Wanna try PlayCanvas’ WebVR lab? Click here. Nearing midday, Diego Marcos and Kevin Ngo from MozillaVR hopped on stage to do a tutorial about A-Frame. A-Frame, the web framework for building Virtual Reality experiences shines when targeting web developers and creative developers! Check out the A-Frame School tutorial here! Finally, Peter spoke to us about how progressive enhancement and the notion of Progressive Web Apps is a match made in heaven for WebVR apps, as it enables them to run offline and scale across devices. See Peter’s slides about PWAs. We had a blast, and 8 hours passed very fast. It was time to hop on a plane and prepare to chat and learn with students of the Film department of the University of Nevada Las Vegas… but first, here’s a 360° “selfie” with some attendees at IEEE VR 2017! 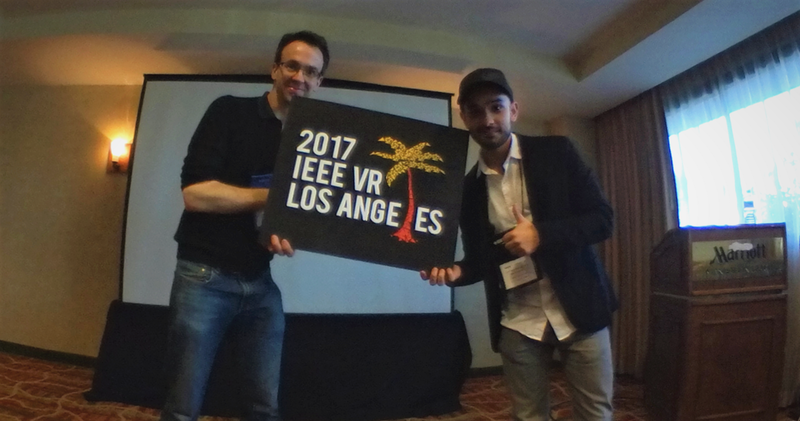 here’s a 360° “selfie” with some attendees at IEEE VR 2017, featuring MozVR and Samsung Internet! In a 2.5 hour session, we presented our take on VR. Our take on why it makes sense from a distribution perspective to create content for the web. About the power of a link. And we got feedback from students about their current view on VR and what works for them. It’s certainly empowering to be able to have these discussions in an environment that fosters innovation like the academia! Not to slow down with the 360 selfies, here’s one caught by our host! Here’s the demo star of the presentation, Peter’s rubber duck on the Seine in Paris. And for the curious, here is the code. Talk about A-Frame’s “Hello World” going on vacation! It is only through collaboration that we will get to real innovation. We like to encourage the use of standards compliant technology to create experiences that are accessible to all. With the rise of Virtual Reality, the web can take a stand in creating these accessible applications that scale gracefully independent of device or platform. In this vein, we like to hear what you think of the Web and VR, and how they can foster more personal content tailored to the user. Get in touch!